When an astrologer makes a forecast about politics there is usually some sort of bias in the prediction. As much as individual practitioners might protest that they remove their personal political opinions from their astrological forecasts, there always seems to be a component of wishful thinking. When attempting to predict, it behooves astrologers to examine the astrology dispassionately so as to not make biased forecasts. Often, one can see astrologers attempting to fit history to astrology and their personal preferences rather than examining both historical and astrological facts from neutral ground. This article is an attempt to report the astrology of the upcoming United States presidential election, inauguration and subsequent administration without personalizing it. No names will be mentioned except for historical clarification, nor will political parties be discussed. The hard and fast astrological configurations will be discussed along with the historical realities of the times those configurations took place. Where does one begin when discussing the attainment or transfer of power in a nation? The legal realities. In the United States of America, the legal reality as far as presidential elections and inaugurations are concerned is the Constitution. What does the Constitution say about presidential elections? of the Senate and House of Representatives, open all the Certificates, and the Votes shall then be counted. The Person having the greatest Number of Votes shall be the President, if such Number be a Majority of the whole Number of Electors appointed; and if there be more than one who have such Majority, and have an equal Number of Votes, then the House of Representatives shall immediately choose by Ballot one of them for President; and if no Person have a Majority, then from the five highest on the List the said House shall in like Manner choose the President. But in choosing the President, the Votes shall be taken by States, the Representation from each State having one Vote; a quorum for this Purpose shall consist of a Member or Members from two-thirds of the States, and a Majority of all the States shall be necessary to a Choice. In every Case, after the Choice of the President, the Person having the greatest Number of Votes of the Electors shall be the Vice President. But if there should remain two or more who have equal Votes, the Senate shall choose from them by Ballot the Vice-President. Now that doesn’t quite sound like what we speak of when we think of presidential elections, but that is the reality. On federal Election Day (the first Tuesday after the first Monday in November in even-numbered years – every four years for presidential elections), the public doesn’t vote for president – but for Electors to vote for president. What we have on Election Day is 50 separate state elections for Electors. Of course, we could look at the charts for each state’s election taking into account the time the polls open for each. But that is complicated by the fact that some states allow early voting and there also is the fact of absentee ballots. There wasn’t even a uniform day for choosing Electors until 1845. However, Election Day is burned into the public’s consciousness. The media ramps up coverage well in advance of the day, in some states it’s a holiday and that Tuesday in November is touted as the be-all and end-all of the election process. So, what can we do to look at Election Day astrologically? One way is to set a chart for noon that day and see what things will change over the course of the day. Another is to see if there is a compelling astrological factor that will provide enlightenment on the processes involved on that day or close to that day. We can also attempt to relate the astrological configurations of that day to previous elections. This article will attempt to do all three. The Moon will be in Leo all day and no other planets will change signs. However, there is a Mercury station that day, and it turns retrograde. 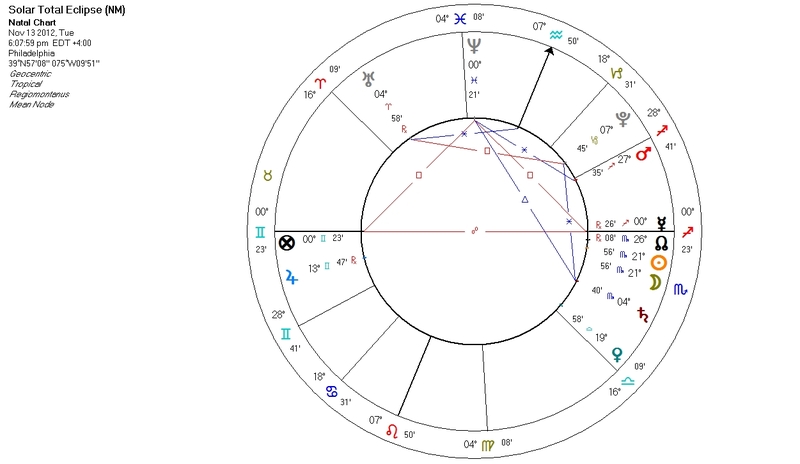 Looking at the chart (set for Philadelphia, the USA birthplace) for the moment Mercury turns retrograde, several things look striking. The chart, with Gemini rising, is Mercury ruled with Mercury placed in Detriment and Face, in a mutual reception with Jupiter in Gemini by both Domicile and Triplicity. The Moon is partile conjunct the IC and also applies to a partile sextile with Jupiter (and squares the Sun partile also). The Moon’s last aspect will be a trine to Mars. The most recent presidential election with Mercury stationing and changing direction was in 2000, and one can recall the issues we had with the delayed outcome. There could also be a delay in the results of the upcoming election, but there are kinder aspects on this day than that of the 2000 election. The Moon at the base of the matter (IC) suggests that the people will ultimately make the choice this time around. In the 2000 election, the Moon went void of course around the time the Florida vote was placed back in the undecided column after previously being called by the networks for one of the candidates – starting the confusion (Mercury applied to square Neptune after turning direct and changing signs) that led to court intervention. 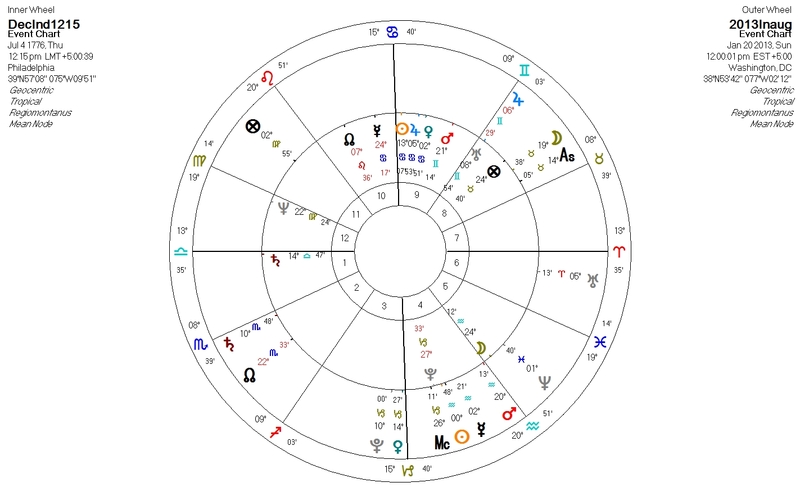 There are of course other astronomically derived charts astrologers may consider for this election. One would be the Libra Ingress chart for 2012 – the Autumnal Equinox that falls prior to the election. Let’s have a look at some themes in this chart. 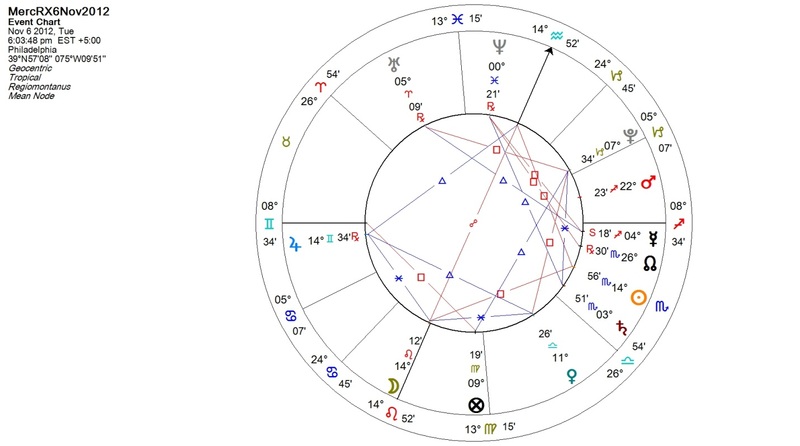 At the USA’s birthplace (and also at Washington DC) Scorpio rises with a very strong chart-ruler Mars close to the ascendant in the 1st House. A Venus in Leo squares both the ascendant and Mars. The Moon applies sextile Saturn – her last aspect prior to leaving Sagittarius. The last part of the run up to the election will be very contentious, with a high probability of underhanded tactics by either or both sides. It is hoped that the stabilizing influence of the Moon’s sextile to Saturn will allow the public to see through the morass. There is also the Mercury stationing direct after the election. However, this occurrence is also bracketed by a pair of eclipses – one Total Solar and one Appulse (or Penumbral) Lunar. First, examine the Total Solar Eclipse of 13 November 2012 – set again for Philadelphia. 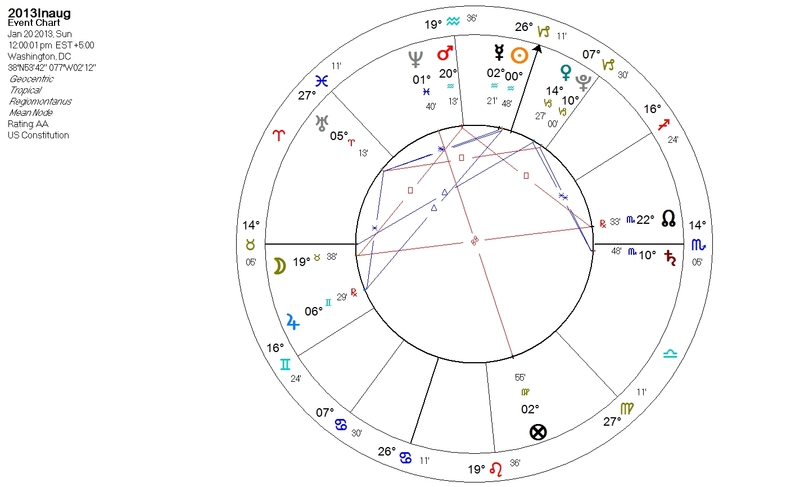 As in the Mercury stationary retrograde chart on Election Day, Mercury rules a Gemini rising chart from its Detriment, but in Mutual Reception with Jupiter in Gemini. The sextile between Mercury and Neptune has moved to a partile aspect – separated only by 3 minutes of arc. As of 13 November 2012, we may still not have a definitive outcome for the election. In fact, this might be the time of most confusion. The Mercury station direct chart is what we will consider next. Mercury has moved back into Scorpio by this time – losing the Mutual Reception by Domicile it shared with Jupiter. The applying opposition of the Moon to Mercury could point to the public’s will being frustrated – or even perhaps the public refusing to stand still while their will is discarded. The Lunar Eclipse on 28 November 2012 offers yet more for contemplation. With Capricorn rising with a partile Mars/Pluto conjunction just above the ascendant, one might expect upheaval; but also notice the ascendant’s Domicile ruler Saturn on the MC with Venus and the moon applying to Jupiter. The people’s will may be imposed no matter what the powerful want. Any 20 January at noon inauguration will, of course, have a Sun in Aquarius near the MC and Taurus rising. There are a few variables each year. 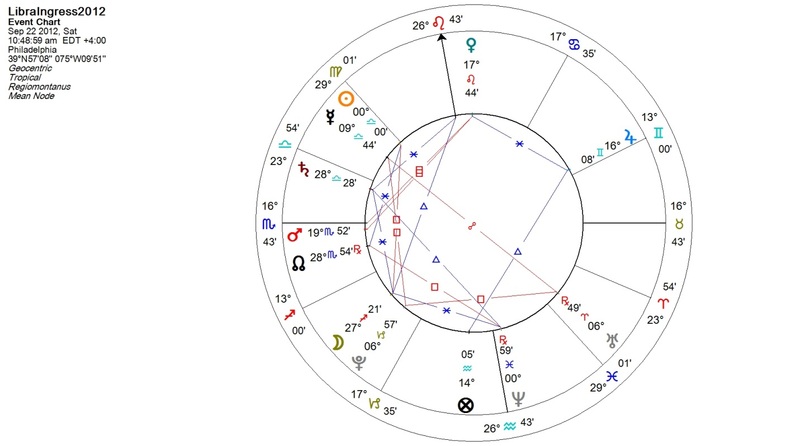 One of those is the Moon position – which this year, for the first time since Franklin Delano Roosevelt’s second-term inauguration on 20 January 1937, has the Moon placed in Taurus. 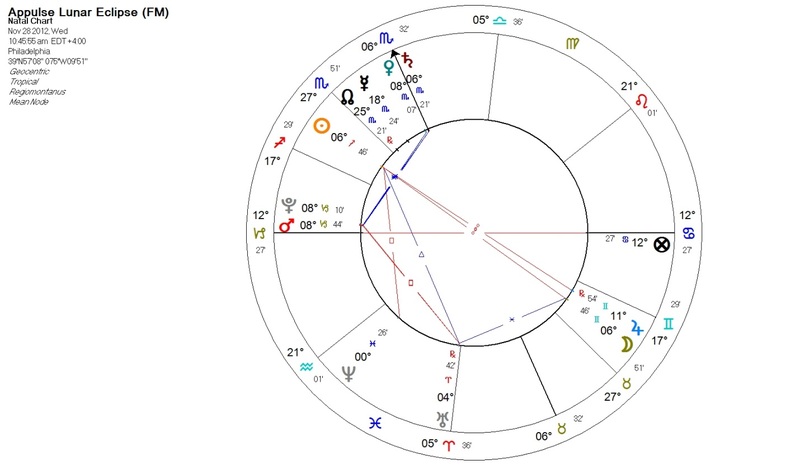 The exalted Moon rising in the 1st House separates from a trine to Venus and applies square to Mars, the last body it will aspect prior to departing Taurus. 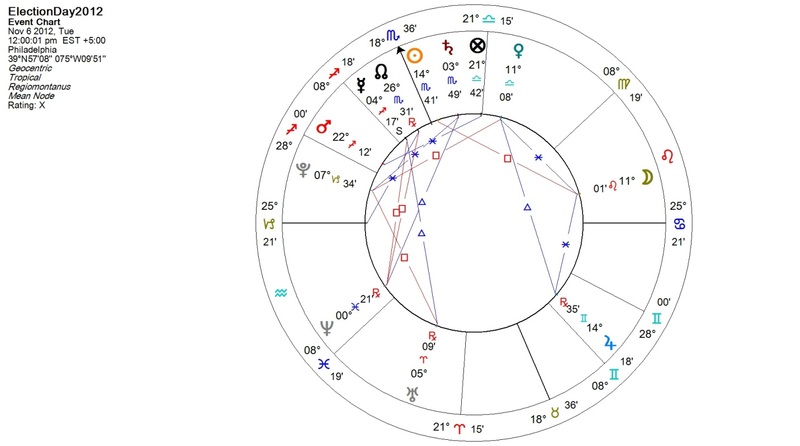 She also moves toward a conjunction with the Moon’s South Node – not the best aspect to have in an event chart. There is no planet in Domicile in this chart. There is a mutual reception between Mars and Saturn at the base of the chart – every planet and point in the chart disposes to it. The public ceremony the following day, Jan 21 – because of the actual day falling on a Sunday – changes the Moon’s position to Gemini and applying to Jupiter. 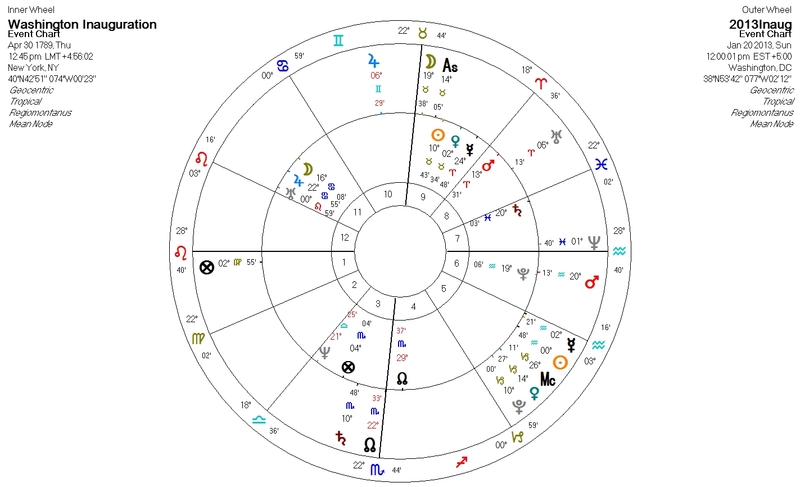 The interpretation one could take from this particular chart is that the Inauguration itself might be a joyous occasion, but there are issues that will cause even more divisiveness in the political process (South Node in the 1st House and the malefic planets Mars and Saturn in Mutual Reception at the root of the chart). An additional way of looking at the Inauguration chart is to see where that chart plays out around the world by looking at a locality map. Some factors that might strike one immediately are the lines going through South America. 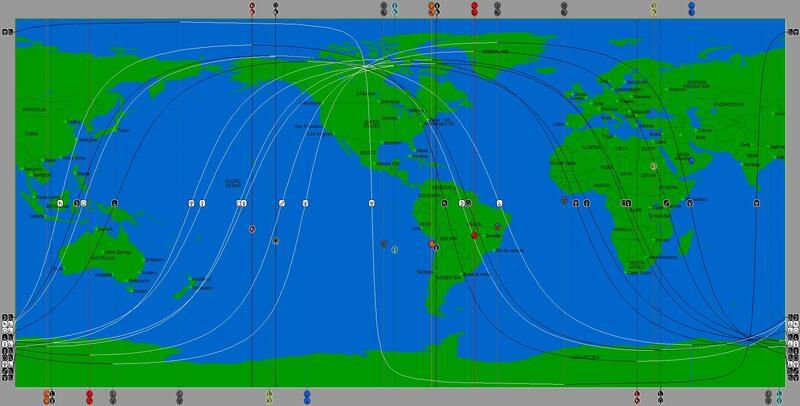 Sun, Mercury, Moon and Saturn lines all pass through at least part of Venezuela. This suggests increased tension between the USA and Venezuela during the upcoming term of office. Another area where you see these same lines are in Southeast Asia, Indonesia and the Philippines. Keep a close watch on how U.S. policies may impact countries in that area. Mexico will continue to be a big issue, with Uranus and Pluto lines bracketing Mexico City. Another line of note is the Jupiter MC line – which comes very close to Iran’s capital Tehran. Could this signify a change in status for the better between the USA and Iran during the upcoming administration? This line also crosses the Gulf, Saudi Arabia and Yemen to the south and the Russian Federation well east of Moscow. One can take a look at the map itself for other possible hot spots. Next we can quickly examine the 2013 Inauguration in relation to two USA founding charts. First let’s look at it in relation to the Washington’ first Inauguration. This chart may be used for the Presidency and for the U.S. Federal Government in general – because this is the moment when the election requirements of the Constitution were fulfilled. The time on Washington’s inauguration was imprecise, with the only time noted as him leaving his house at noon to make his way to Federal Hall in New York City to take the Oath of Office. Washington wasn’t inaugurated on March 4 as the Constitution states due to the Electoral votes not being counted until after Congress convened in April of 1789. Washington was notified of his selection by the Electoral College by letter on April 14, and set off two days later for New York City and the inauguration. There are some interesting connections made between these two charts. 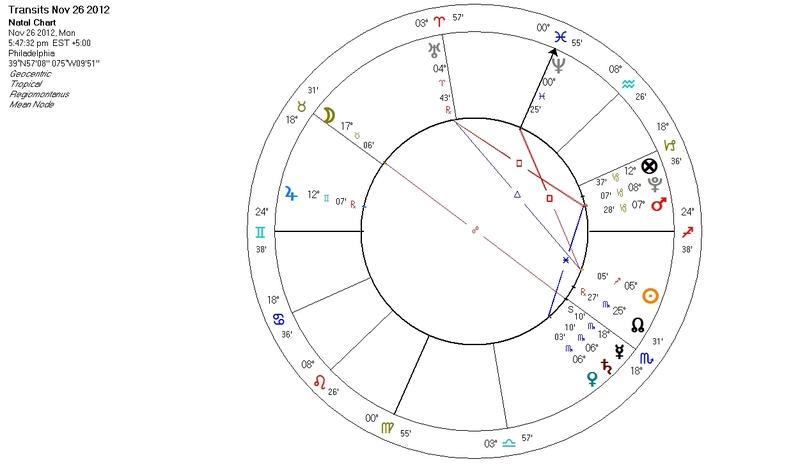 The 2013 Exalted Moon is close to the Taurus MC of the 1789 chart (and may be closer still if the time is a bit earlier on the Washington Inauguration) .The Moon’s Nodal axis also lies on the MC/IC axis. Mars falls on the 1789 Pluto, squares the MC, and trines the Neptune, while Saturn opposes the Sun. That significant Mars/Saturn Mutual Reception may change the entire nature of the Presidency. Determining when a nation (not a government) is born is open to some debate. The date of July 4th, 1776 is so ingrained in the psyche of the United States as its birth date, using other dates seems rather pointless. The question then comes down to: what time does one use? One would be unwise to ignore the historical record. A look through Charles Thomson’s (Secretary of the Second Continental Congress) handwritten notes on microfiche at the National Archives Philadelphia branch show that the business of the adoption of the Declaration of Independence (Not the mass signing – which was a historical fiction perpetuated by a painting. Only John Hancock, as president of congress and Thomson, as secretary signed on July 4th) took place early in the order of business. Alas, there is no source for this on the Archives website, and during a visit to Washington DC to find a source, it was found that the writer of the above had died and there were no source notes available. Working with a base time of noon, one may wish to rectify the chart to mitigate the Void of Course Moon by inserting Fortune so that the Moon applies to it. When one looks at this comparison of the United States as a nation (not the U.S. Government), some things pop into focus. The Saturn/Mars Mutual reception at the base of the 2013 chart fall into the2nd House (Saturn) and the 5th House (Mars). Saturn limiting finances in the 2nd is at odds with Mars looking to have a good time in the 5th House. The saving grace of this chart might be the Venus with dignity by Triplicity on the on the IC. She opposes the 1776 Sun, but perhaps she is lending perspective to where the USA needs to be looking – home. When looking at charts such as these, one must remember to pay strict attention to the both actual concrete historical and astrological timing. Look first to Election Day – which in 2012 affords us a precise time to cast a chart for the Mercury Station; and the Inauguration chart, which provides us a precise chart time mandated by law. Once we have those charts, we may proceed to incorporate other pertinent charts into our delineations to flesh out the story and improve our accuracy while removing bias and subjectivity. Only by remaining unbiased and objective can we hope to be accurate in our mundane and political forecasts.